Guatemala was a short stop but it was a pretty amazing one and I can’t wait to get back there to explore more of the country. 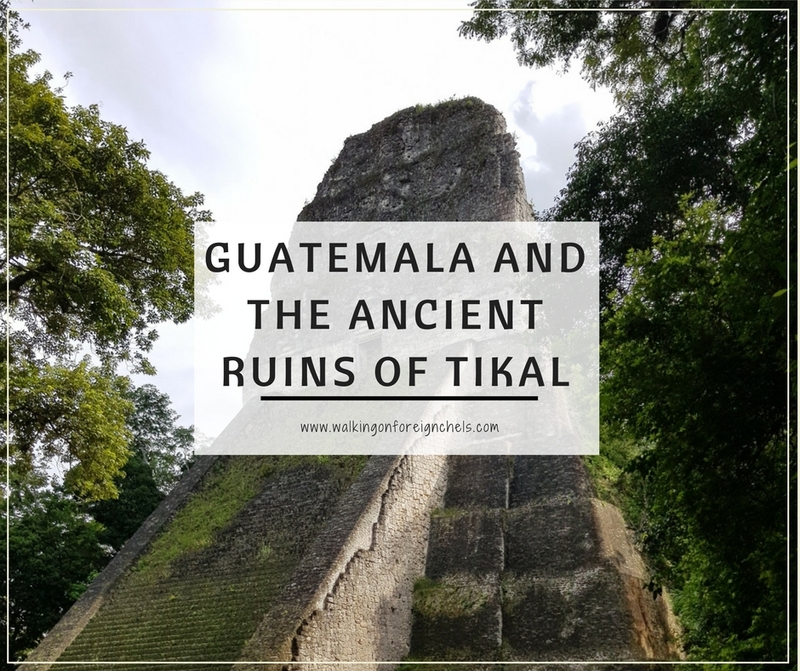 We were only there for 3 nights and only really got to see Tikal and the Museo Nacional de Arqueología y Etnología (National Museum of Archaeology and Ethnology) in Guatemala City. 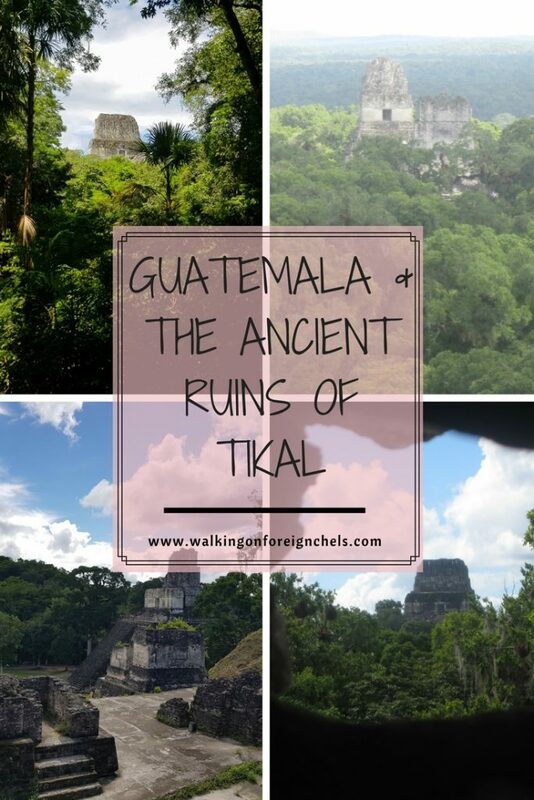 But Tikal is soooo far away from Guatemala City! How do we get there?? After a super long 48-72 hours of traveling from New Zealand, we arrived at our hotel around 11pm only to have to be up and back at the airport by 4am for our flight to Flores the next morning to get to the ancient Mayan city of Tikal. We arranged to have Roxy Ortiz as a guide for Tikal, she is absolutely awesome! If you go to Tikal, make sure you book a tour with her!! She usually does sunrise or sunset tours but because we were only there for the day she made an exception for us. But do I really need a guide?? YES!! 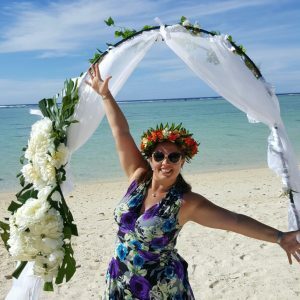 You do need a guide and the guide you need is Roxy Ortiz! Roxy is a trained archaeologist and has worked at El Miridor over the years and while she hasn’t done any work at Tikal, she is from the area and knows the site well and is an encyclopedia of Mayan history. We spent about 4 – 4.5hrs with Roxy before exploring the site on our own until dark. It’s a massive, sprawling site and it’s hard to believe only 9% of it has actually been excavated. It’s a bit of a nightmare to get around as apparently no one believes in maps over there. If you’re looking for a business opportunity in central America, maps of these sites would be a winner!! 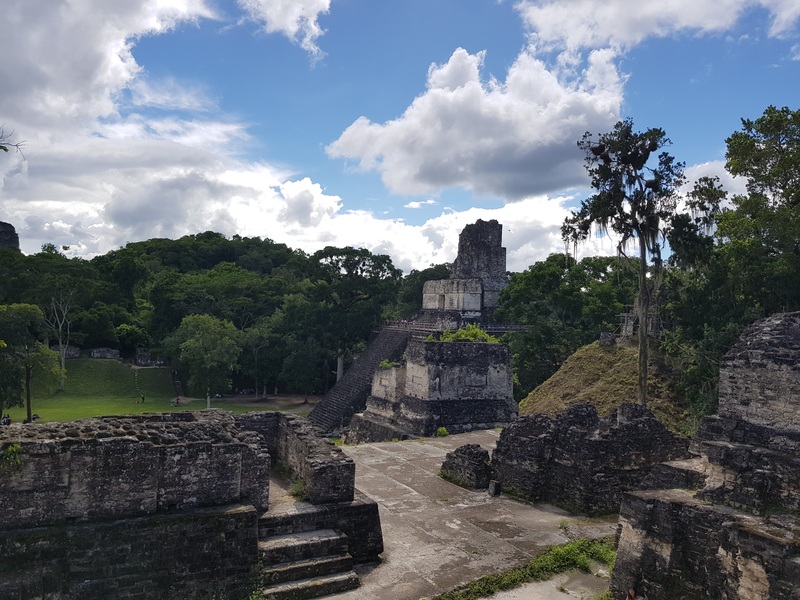 Tikal is set inside the 57,600 hectares of the World Heritage listed Tikal National Park, which is part of the bigger region known as the Maya Biosphere Reserve. The Biosphere is over 2 million hectares and includes the Peten region of Guatemala, Belize and Mexico. 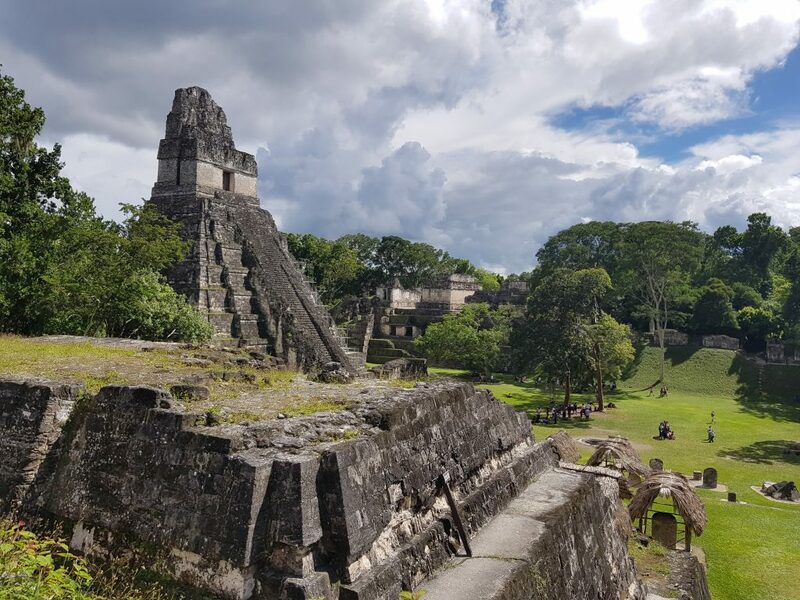 The National Park is comprised of wetlands, savannah, tropical broadleaf and palm forests with thousands of architectural and artistic remains of the Mayan civilization from the Preclassic Period (600 B.C.) to the decline and eventual collapse of the urban centre around 900 AD. What is there to see?? So much! 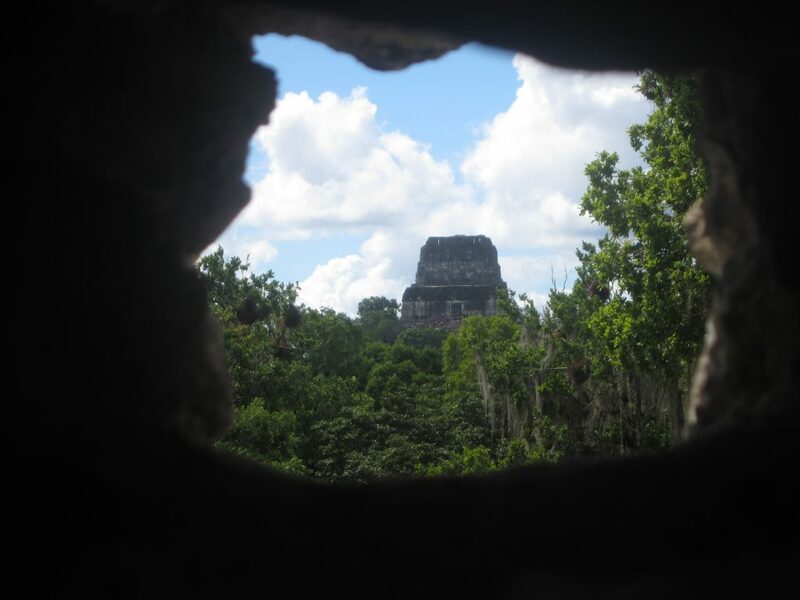 Even though on 9% of Tikal has been excavated there is still enough here to keep you going all day. I think we probably could have spent another whole day there and seen something new. The paths are all winding through the jungle and it is quite easy to get a bit turned around. We ended up going back on ourselves a couple of times while trying to locate a particular pyramid. There are also a number of buildings that have not been excavated hidden in the jungle, some are close to the paths though. They’re pretty easy to spot as they’re giant hills in the middle of a flat landscape. The buildings that have been excavated though are incredible! The engineering that went into creating these structures is unbelievable and it’s a shame they were swallowed up by the jungle when they were abandoned. To see them when they were new and shiny would have been out of this world! The buildings we see today are just plain stone, still impressive but when the Maya were here these buildings would have been covered in stucco and then painted red. All the surrounding buildings in the plaza would have also been painted red and the floor would have been white. The Maya had access to red, yellow, black, blue, and white paint and they used it to make their world colorful. Some of the buildings had stone carvings of gods that would have also been painted in different colors and they would have had beautiful murals of gods and rulers painted along their walls. 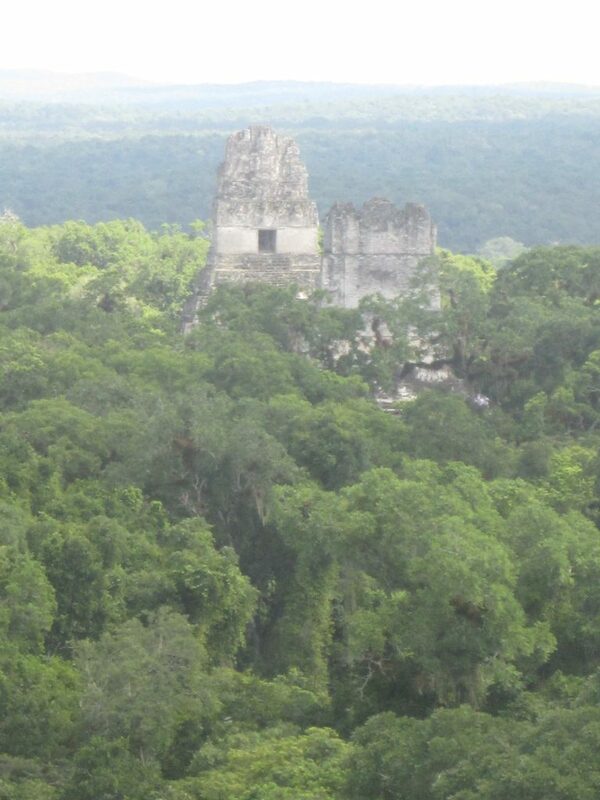 Imagine none of the trees around as the Maya cleared away all vegetation to make room for the buildings and for agriculture. It would have been a very open, bright, and vibrant city at its peak with 100,000 inhabitants. The Maya had a vast trading network with other Mayan sites around Mesoamerica, which is evident by the artifacts that have been found throughout the site that originated in other areas. 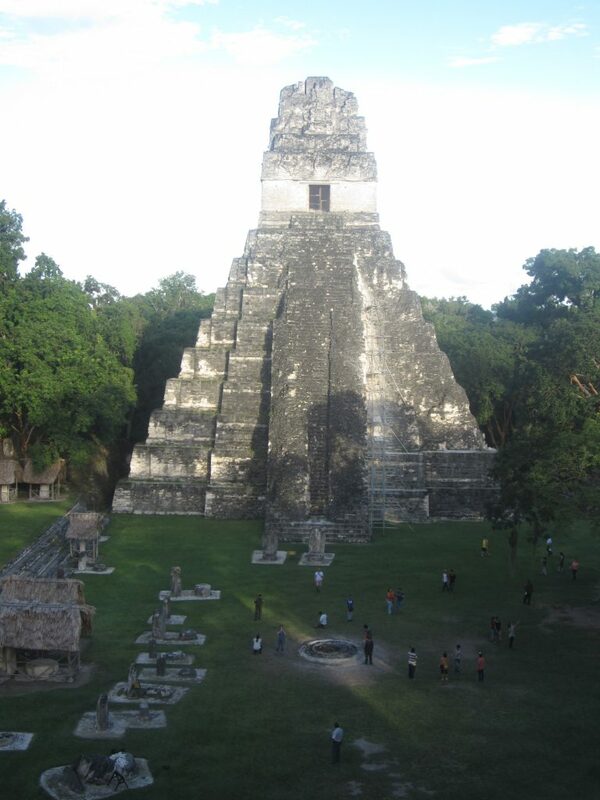 What is particularly amazing about Tikal is the fact that it was not built near a water source as many other sites were. Instead, aqueducts were built to bring water to the city and giant reservoirs were built to hold the water as well as to collect rainwater. They would put water plants and fish in them to filter and airate the water to keep it clean. We saw a bit of wildlife while we were at Tikal, mostly monkeys (Howler & Spider) which was awesome! I’ve never seen monkeys in the wild before, so I was pretty stoked! When we first arrived at the site to meet Roxy we saw some hummingbirds flitting about in the large flowers. We don’t have hummingbirds in New Zealand and I’ve never seen them in a zoo or animal park before so getting to see them in Mexico was pretty amazing for us! Only a few hundred yards from the hummingbirds we spotted some toucans flying among the trees. Another species we don’t have at home haha. Our birds are boring colours! The howler monkey’s are so loud! It’s incredible and they sound like big cats growling in the distance but they don’t move around much during the day and I don’t blame them – it’s way too hot to swing around the trees. They lie around and sleep in the trees so they can be hard to spot. 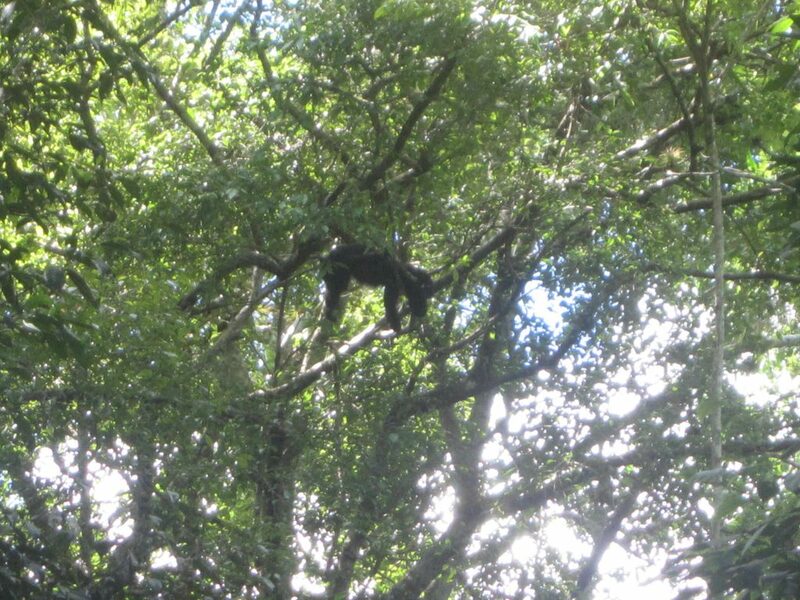 Spider monkey’s on the other hand come crashing through the tree tops, not giving a damn who hears them coming! We were hoping to see other animals like ant eaters, armadillos, snakes and birds galore but I think during the day you’re unlikely to see that kind of thing as they’re mostly out in the early mornings or evenings. Another reason to do the sunrise tour with Roxy!! There are five species of big cats that call the park home, including jaguars, pumas and jaguarundi. We didn’t see any of these and while I would love to see one, I’m not totally sure how I would react haha! Apparently, it is really hard to spot jaguars and Roxy told us that she sees maybe one or two a year and she’s there everyday so it’s not a common occurrence. Roxy drove us back to the airport in Flores and most of the drive there is through the Tikal National Park. Roxy spotted a few Red-Rump tarantulas on the road which we stopped to have a look at, and because we were told they weren’t venomous, I took one for the team and held one! It felt really strange, it was a lot heavier than I expected and the hairs on its legs and abdomen felt sticky. If you haven’t yet, definitely take the chance to step outside your comfort zone and hold one. I’d do it again and Shane was kicking himself that he refused to hold it (haha!). We kept an eye out for scorpions and snakes as well but didn’t spot any on the road, we did spot a a Grey Fox though which ran across the road in front of the car. I only saw its tail but it was a fluffy tail! Now I can’t really tell you what to see in Guatemala City as I only spent a few hours there and when we got back from Tikal we only had a few hours sleep before heading off to Copan for the night. We ended up with about 4-5hrs to spend in the city so we decided to spend it at the museum, wandering through the exhibits. It’s a really cool museum and we learned a lot about the site that Guatemala City is actually built on – Kaminaljuyu. 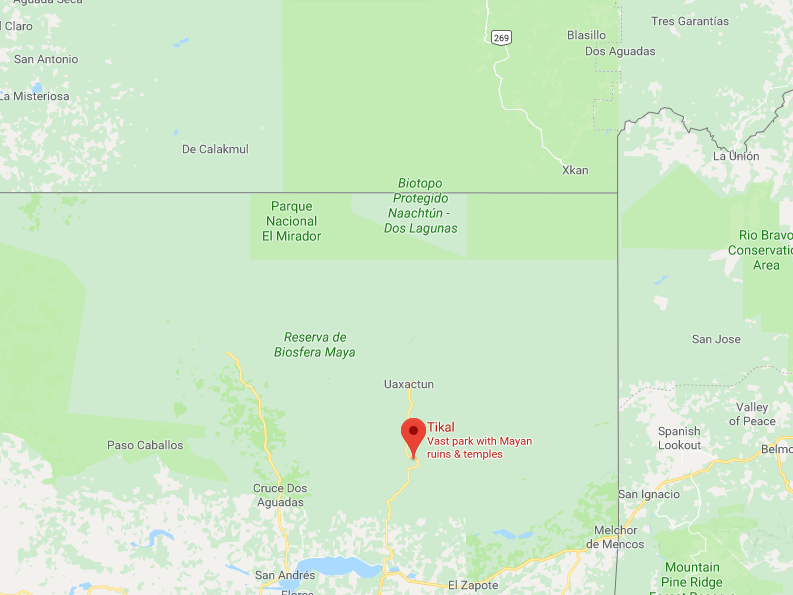 It was a strange coincidence that we learned of the site; I was reading Grave Secrets by Kathy Reichs and it was set in Guatemala and she mentioned in the book about the site. I asked Shane about it and he’d never heard of it so I googled it and what do you know?! Lovely post. Looking forward to more. I would suggest increasing the font size a little to make it easier to read. Brilliant read and information, loved the photos too, a destination I need to add to my bucketlist. Saved for future reference. 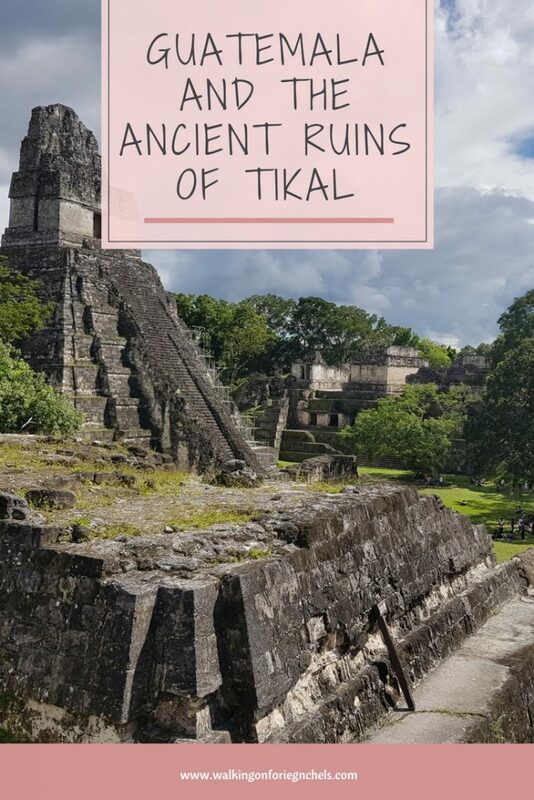 I have always wanted to see the ancient ruins of Tikal. I need to plan a getaway to this place soon!